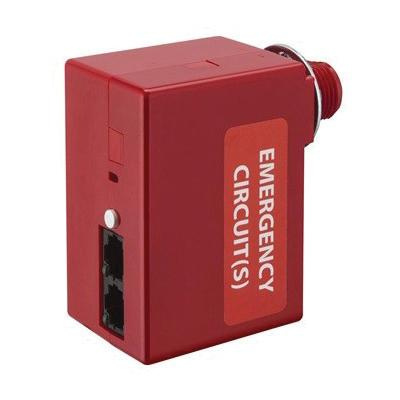 Lithonia Lighting Sensor Switch™ nLight® Emergency power/relay pack communicates with nLight® networks and delivers 40-Milli-Amp of bus power/RJ45 port. It is perfect for commercial and industrial lighting control applications. Red colored device with gloss finish can be mounted on a 1/2-Inch knockout. It has voltage rating of 120/277-Volt AC and current rating of 40-Milli-Amps and power rating of 1 hp. It features self-contained relay switches line voltage load and is remotely configurable/upgradeable. Power pack is UL listed.